The works of Ashley Billingsley and Sarah Wentworth included in this exhibition are situated in the natural landscape. Billingsley’s paintings embody the shapes and textures of leaves, bark, and ferns while leaving space for the viewer’s own curiosity. Her paintings provide a sense of wonder in part because of things that aren’t there but that you can sense; A line starts to sneak off of the page or an image will be saturated in one area but not another. The subtle smudges, eraser marks and use of negative space have the potential to coax the viewer into the present moment as they absorb the thoughtfulness of each mark. Sarah Wentworth’s photographs employ light, color, and a mysterious creature in a way that is equally mesmerizing. In Wentworth’s own words “The Fishline Creature is an 'unknown being' reminiscent of the mythological selkie, a creature living along the water’s edge, having emerged from the ocean.” The pink in the sky, white of the snow, and careful compositions make the photographs feel as though they have captured a fleeting moment. Many of the photographed scenes take place at the ocean’s edge. The way the creature captures the light is uncanny, bringing to mind the shimmering skins/scales of animals that live under the water’s surface. Yet, the creature’s skin is actually knit out of fishing line—synthetic material—raising questions about the impact of human production on the environment. 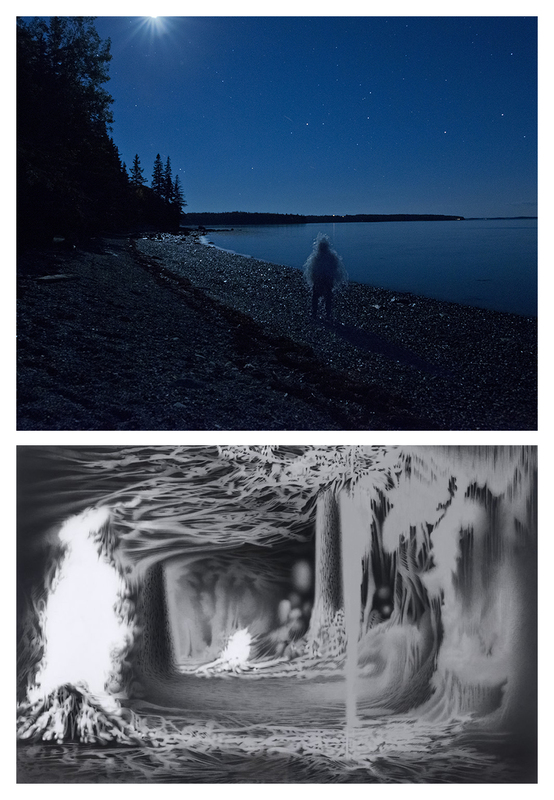 Billingsley’s drawing series Fire in Woods seems to embody its own mythos with a billowing fire absent of any human beings. Both artists delve into dark and beautiful reflections of the natural landscape while remaining open in a way that seems to acknowledge how much we don’t know about the natural world and our place in it.